My cub was flooded in Hurricane Florence, and I drained all the good stuff and replaced fluids, had to jump the battery and ride it for about two hours. Started the other day she died within 10 minutes. Had to push it up to my garage, and put the charger on it because i drained the battery trying to get it to start. I've rebuilt my carb because i thought it was a gas issue (had a little residue from old gas, but otherwise clean). I'm not getting any spark so I'm going to buy new plugs in the morning, but I'm not getting a noticeable jump in voltage when I crank (measures at spark plug wire & ground). Is there anyway to check my distributor, ignition coul, or (that little white bar that is attached to the distributor, I'm not sure what it does, has twowires, one on each side)? "Sometimes I just like riding around my yard for no reason. I find it helps with being retired before the age of 30." Too bad your place and the Cub were flooded. You probably washed it well, and removed the dirt or mud, if it had that. You didn't say what year Cub you have, or if it's 6 or 12 volts, or has a Battery Ignition unit, or magneto. The white bar near the Battery Ignition unit, or magneto, whichever it has, is probably a resistor to reduce 12 volts to 6 volts. I guess you have a 12 volt battery. I would start by checking the ignition points, they have to be clean and flat, and not burned. Wash out where the points are if it has water or mud in it. Then dry it with air. Wear your safety goggles when using the air. Below are pages from the 1965 Cub owner's manual, showing the points in a Battery Ignition unit, beginning on the right side of the first page. You should identify which style of fan hub it has. If it has the older,original style fan, that uses motor oil for lube, and has the filler screw on the side of the fan hub, they had no seal at the rear of the assembly. It probably has water in it, if the water was as high as the fan hub. If so, you should take the fan assembly off, clean it, and dry it out. If it is like the older ones, if you hold it on end, with the fan blades up, oil or water would run out where the shaft goes into the assembly. If it has water, you should dissemble the unit, and clean it out inside. Be careful and notice the spiral piece inside the unit, it has to face one way, so the oil will lube the shaft. The Cub owner's manual tells how to lube the fan when you are ready to use it again. It uses motor oil in it. Below is a page from the 1955 Cub owner's manual, telling about lubing the fan hub. There was a newer style of fan hub that has sealed bearings, they don't use motor oil for lube. Last edited by Glen on Fri Oct 05, 2018 10:12 pm, edited 3 times in total. I got caught in a thunderstorm once and my cub would not start until everything dried out. Took it about 3 days and it sputtered and missed some until it dried out. Some distributor caps had/have vent holes. Water can sneak in a submerged cap probably ,even if un-vented. One of the few actual good uses for W.D. ,is( as it is named as "Water Displacer") getting rid of moisture. Distributor cap contact areas can be wiped then sprayed. Check for any moisture or deposits where coil and condenser screw holds their contacts in place. Also the back contacts/connections of your ignition or kill switch. As mentioned your points need to be clean and dry too. Check them for possible burn build up. A good time to re grease in there too. Your battery needs testing. Then your charging system. Unless belt was slipping (it should have squealed a bit ,but water is lubrication of sorts ) you might want to know if it is a bad battery ,or charging. Easy does it ,but fresh fuel with a generous splash of seafoam might help if water is in your fuel system or carb. Good that you and your Cub made it through. Onward! Sorry about that. It's a '49 running 12v. I've checked the distributor, it looked dry. But I'm still not getting spark. I wd40'd the distributor, magneto(? ), Kill switch, starter terminal, and other misc terminals. I also put seafoam in my tank with fresh fuel with no luck. How do I check my magneto? Should it move when it tries to crank? this one looks like it's all gunked up in the springs, but rattles when shaken so I don't know. , which is my winter project, and I got all the parts in my garage. But the water got 4' or 5' of it. I do not know if this will help but I would clean the ground connections at the battery and battery ground to frame. At least for purposes of troubleshooting, I would not ground to the sheet metal of the battery box but to the torque tube or rear axle. I've got my battery grounded to one of the bolts on the gear shift. I have to disconnect the negative terminal so it won't drain the battery when it's off. I replaced plugs and the ignition coil. I HAVE SPARK! Now I think my battery is shot... How do you check the alternator? I hooked up the battery, and after an hour or so(working on getting the engine to fire), I had a wire melt and almost catch(while I was hand cranking[electrical was all set to Run]) (my wife got up and brought to fire extinguisher). After some quick repair work, I tried the electric starter and my starter poped, and began to smoke. I'm not quite sure what was melting, but it also blew my voltage dial thing. I'm not really sure how the previous owner had it all wired, but I'm working on converting it back to match the diagram. Last edited by Jmb9313 on Sat Oct 06, 2018 8:05 pm, edited 1 time in total. Good that it has spark. The Cub looks good in your picture. It looks like it is a Battery Ignition unit, not a magneto. It's hard to see it in the pic. It looks like it had an old original style coil, they get weak and quit sometimes. It takes a bigger diameter coil bracket to use a modern style coil, to replace the older one. 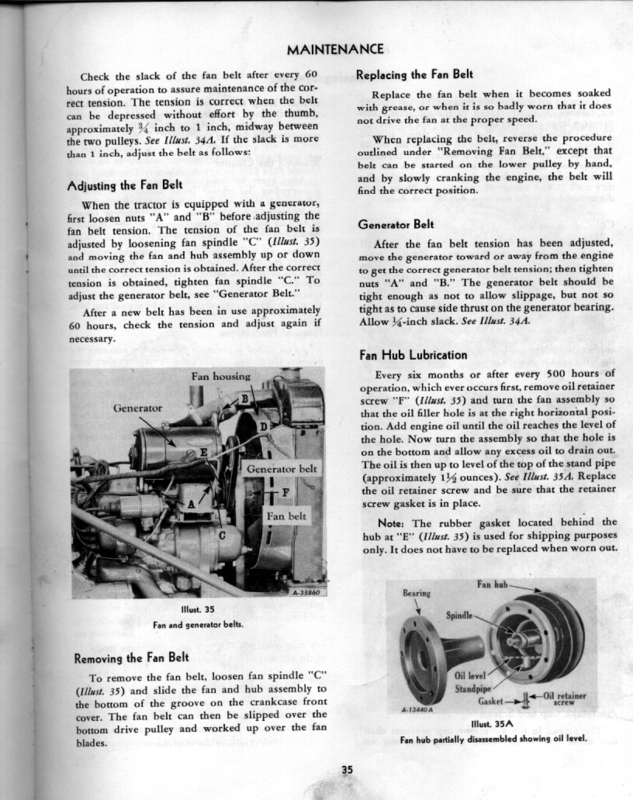 Below is the 1955 Cub owner's manual, it has lots of information about operation, maintenance, and lubrication. There is a table of contents on page 1. It shows the Battery Ignition unit, beginning on page 31. That is a coil of wire in the resistor. Is has to show good with a tester, and not be broken, so power will go through it. If you have the hood off the Cub, it would be good to move the resistor in out of sight, so it doesn't get hit and broken. On the engine side of the coil is a good place. New batteries usually need charging for several hours with a 6 or so amp battery charger. Don't use a big output charger. Use a charger that automatically reduces it's rate of charge as the battery charges up. The ammeter on the Cub should be showing some charge at speeds above slow idle. A 1949 Cub came with a 6 volt positive ground electrical system. You should identify what voltage the Cub is, they came with a generator. It still has the 6 volt starter, in your pic. 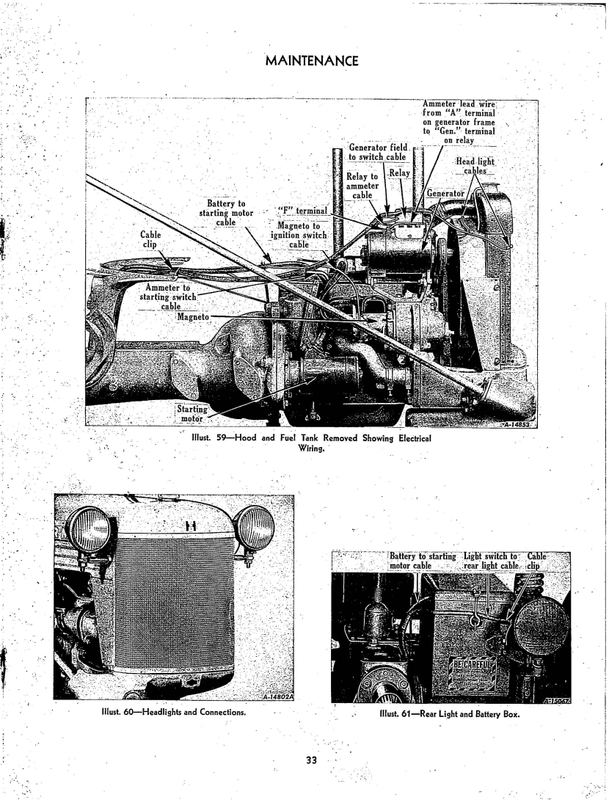 Below is a page from the 1949 Cub owner's manual showing the generator and other electrical parts. This Cub has a magneto, which all 1949 Cubs came with. Someone has changed yours to a Battery Ignition unit, if that is what it is. If someone has put a 12 volt alternator on it, to test the alternator, connect an automotive test voltmeter to the battery. It should show 13.5 - 14.5 volts when the engine is running at half or more throttle. The people on here say that a voltmeter with a dial and pointer works better for a Cub. If the voltmeter doesn't show any change with the engine running at high speeds, the alternator is not charging. Last edited by Glen on Sat Oct 06, 2018 10:38 pm, edited 1 time in total. Jmb9313 wrote: I have to disconnect the negative terminal so it won't drain the battery when it's off. There are three possible causes for the battery drain. 1) Short in the electrical wiring. This would be obvious, melted insulation, and/or hot wires. 2) Cut out in voltage regulator stuck. That is if you have a generator and voltage regulator. 3) Alternator not wire correctly. If you have the 3 wire alternator, the upper left alternator terminal must have a light/diode/switch to keep the battery from discharging. Tim, look closely at the pic, I think the Cub has a Battery Ignition unit. I'm not 100% if everything was upgraded to a 12c setup. As it stands now I'm waiting on a new starter/trying to rebuild the old one. But in that proces, I'm replacing old parts that died. Jmb9313 wrote: I'm not 100% if everything was upgraded to a 12c setup. As it stands now I'm waiting on a new starter/trying to rebuild the old one. But in that proces, I'm replacing old parts that died. You asked earlier ,"How do I check my magneto? Should it move when it tries to crank?" Not sure how it can be seen to move , but I use the handcrank to confirm it is at least "snapping". When resetting the mag's timing to the engine it snaps when turned/moved from near the engine outward. That same "snap" should be heard when handcranking when the timing mark on your pulley lines up with the indicator (sharpened rod looking thing) when at top dead center. If a full revolution is given (might as well have the ignition shut off to do this) the mag will snap twice during a full revolution. That means mag is turning and firing. A mag gets oiled or rinsed with kerosene depending on temp conditions being ran in. A mag could in theory hold water after being submerged. Should you get ambitious about peeking by removing it ,study it up well before doing so the first time. Just to ensure proper positioning of both ends when reinstalling ,and how to set ballpark timing.